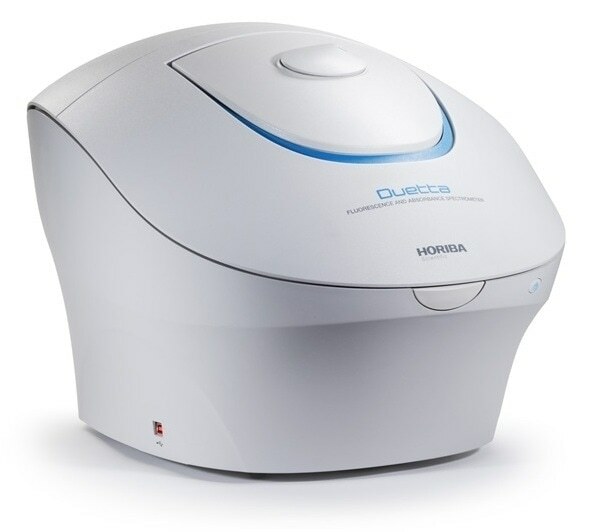 The Duetta™ is the latest bench-top instrument from Horiba Scientific. This groundbreaking spectrometer allows the measurement of both absorbance and fluorescence, and can also be used either merely as a fluorometer, or as a UV-Vis-NIR spectrometer for absorbance measurement. The Duetta is designed with an automatic real-time Inner Filter Effect (IFE) correction for both Primary and Secondary IFE, which is particularly important for getting a true molecular fingerprint with simultaneous measurement. A new fingerprinting method, called A-TEEM, integrates Absorbance-Transmission and EEM (excitation-emission matrix). The Duetta is fitted with a high-tech Charge Coupled Device (CCD Detector) rather than traditionally used photomultiplier tubes (PMT) for fluorescence detection. This technology allows detection of a full fluorescence spectrum in just a millisecond. A complete 3D fluorescence EEM can be attained within a second. The CCD detector also covers NIR wavelength detection to 1100 nm. The complete wavelength range of the Duetta is from 250 nm to 1100 nm for UV-Vis-NIR Fluorescence detection. 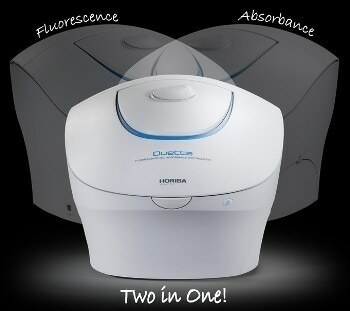 The maximum level of fluorescence sensitivity allows correct measurement even for low concentration samples. Another Horiba Scientific innovation has been embedded in the Duetta – The touch-screen software interface having a selection of Apps for routine analysis.